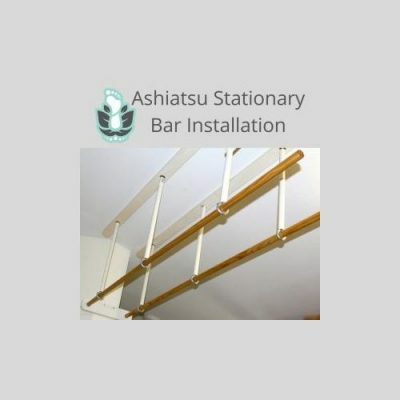 Ashiatsu Bar Advanced Home Study course is an 8 CE NCBTMB approved course with certification. For those who like the comfort of holding a book, it includes a hard copy of the manual, and DVD. Shipping is free inside the USA. Also, the course covers two-footed advanced and sports specific moves for the posterior and the anterior routine. Such as Psoas, Subscapularis, Pectoralis Minor, Epicondylitis, etc….for insertion into the Ashiatsu Bar Basic massage routine. However, the Ashiatsu Bar Basic live class seminar or at home study is a prerequisite for the Advanced level. Like the Basic course, it uses overhead bars for balance. This deep tissue barefoot massage modality developed by The Barefoot Masters® provides the extra skills for clients with specific needs. Additionally, Michelle D. Mace will be your instructor for this training. For added convenience, our online testing will is available for immediate access to test results and the certificate. In the event of loss, it is easily retrieved from stored archives. Of course to grade by hand will take longer. Please allow 3-4 more weeks to receive an emailed certificate. For a mailed hard copy of the certificate, there is a $10 fee in the USA and $25. outside upon request. Most states accept NCBTMB approved courses, including New York. We also have separate provider ship for Louisiana and Florida. If not sure, please check the “State Requirements” on “About” tab to make sure. *Live Course Class – 1-Day Course – You receive digital manual and video as well as hands-on CE’s along with certification. Home Study – Hard Copy of Manual/DVD and test w/certification. Shipped free in the USA. Online- 24/7 for 2-year access to Digital Manual/Video, Bar Install Video, test w/certification and immediately downloadable certificate. Also a 15 minute Skype with an instructor. Need to keep heels and feet soft? In like manner, our Night time Gel Socks with cute leopard print, will keep feet in perfect shape for Ashiatsu Massage.